When it comes to fake tanning, I feel like it’s something we all want to do but can’t be bothered to. Well, at least that’s how it is for me. I do not tan naturally; that is just a fact. I think I have some kind of gene missing or something because no matter how long I stay out in the sun, no matter how many tan-enhancing products I use, all I ever seem to do is burn. My skin refuses to tan. So when it comes to getting that glow, fake tan is my go-to and saviour (and quite frankly my only option). However, as a self confessed lazy girl when it comes to all things beauty, I don’t think it’ll come as much of a surprise to you when I say I can never actually be bothered to tan. Over the past year or so more and more ‘1 hour’ tans have been released by different brands and they definitely made my life so much easier. It was like the prayer from all lazy beauty addicts had finally been answered and we had our quick-fix… And then I realised how ‘quick’ the process actually was and went back into my slump of ‘tanning takes forever’. It’s all well and good having a ‘1 hour’ tan but when you have to wait 3 hours for your desired colour after the initial 15-20 minute application time and then you still have to have a shower, the process can still be quite lengthy. All hope was lost yet again for a quick tanning process… Until Vita Liberata’s newest release popped through my letterbox. 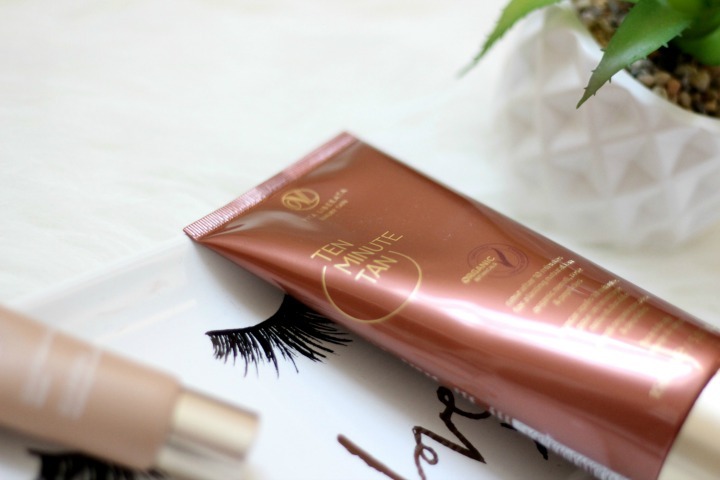 The Vita Liberata 10 Minute Tan – brilliant, I thought – how amazing! The name is it’s first burst of hope, would this tan actually give me a glow within 10 minutes? Alas, nothing is ever as good as it seems and there was a bit of smaller print on the bottle stating development in 4-6 hours. In short though: It’s still not quite quick enough sometimes. The 10 Minute tan initially does exactly what it says on the tin, after a quick 10-15 minute application with a mitt as you would with any fake tan, the job is done and you wait for the tan to develop. This is the quick bit, a short 10 minutes later and you’re ready to jump in the shower and rinse off the excess product. It sounds amazing and for a lazy girl, this is exactly what you want. For a girl in a rush looking for an instant natural lasting glow though, this is where the speediness ends. After your shower the tan then takes 4-6 hours to develop and in my experience, I didn’t fully see the kind of glow that I wanted until around 16 hours later when I woke up the next day. In my eyes, I was still quite pasty up until I went to bed (a good 8/9 hours after I initially applied the tan) and although I do like quite a noticeably darker tan, I was really happy with the light natural glow it gave me for the short time it was on my skin. This is great for someone who wants a quick application / shower off time like the lazy girl within me, but I don’t think this would be the best solution for say a last minute night out preparation – for that I think you’d definitely want more of an instant 24-hour tan such as the Vita Liberata Body Blur Instant Tan which gives you your colour instantly and can just be washed off later that night / the next morning. The colour itself was lovely (albeit not quite as dark as I’d usually like), I wasn’t all that patchy (and where I’d clearly missed a bit, it faded nicely to not give the dreaded patchy appearance) and I definitely looked like I had a natural glow to me. What I was disappointed with was that the colour didn’t seem to last too long at all – two days down and my tan had faded pretty well over the majority of my body. My legs however, did still have a pretty half-decent glow to them 4 days in, so maybe the answer to all of this is to leave the tan on for around 20 minutes before showering off? (The tan on my legs was applied first and then still had the 10 minute wait with the rest of my body). I think the saving grace with this fact is that it does only take around 20-30 minutes to complete the application process again though so before bed a two days or so later you could apply and shower this off again and wake back up with your slightly stronger lovely natural glow again. I guess it’s just personal preference though, on the whole, I’m happy with my legs being slightly more tanned for longer as usually my pins are the bits I want on show most! 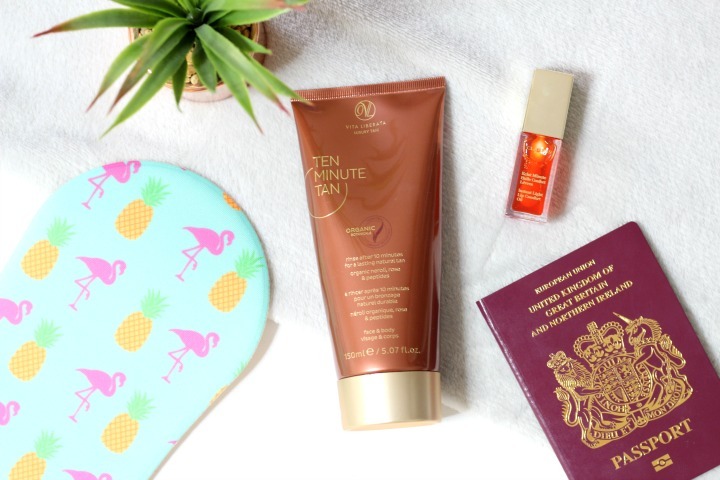 Overall I’m relatively impressed with the 10 Minute Tan and like I’ve mentioned above, I think it’s perfect for the lazy girls within us who maybe want a quick tan for a weekend. Apply it on a Thursday / Friday evening ready for the next day and have a decent two (possibly three) days worth of a lovely all over glow with barely any preparation time involved. If you were looking for a slightly longer lasting tan all over though, I think maybe leaving it on slightly longer next time could improve on the colour for longer. Another thing to note is that the 10 minute tan does have a slight biscuity scent to it when it’s initially applied, but I don’t see this as a problem at all as it’s only on for the shortest amount of time and barely touches your nostrils in that time to make any difference. I do love this tan and would recommend this if you are just looking for a quick-fix tan. Vita Liberata are an amazing tan brand that I’ve used for a few years now and I’ve loved all of their products that I’ve tried so far. This one is great at doing what’s described on the bottle, the only issue I really have with it is that it’s not as ‘lasting’ as I’d hoped. I did search the description for this tan on the VL website, but couldn’t find a detail on how long it’s supposed to last, so maybe it doesn’t claim to last as long as some others, but just something to keep an eye on for when you’re picking out your tan of choice. Although, I guess it does depend on the intensity of the tan that you like. I’ll definitely be trying this again because, Like I mentioned above, I do love the concept and it’s great for how lazy I am – especially if I maybe leave it on a tiny little bit longer for a longer lasting deeper glow. I’d love to know your opinions if you’ve tried this tan at all? It’ll be interesting to see what everyone else thinks! And of course keep an eye on my Twitter and Instagram for updates on how I get on next time! Previous Post Pregnancy Update; 18 Weeks Pregnant, Products I’m loving, Unplanned Hospital Trip & Morning Sickness Returned! Next Post Gender Reveal: We’re having a…..!